My lovely 91-year-old grandmother recently fell, breaking her hip and landing in the hospital for surgery and then rehab. Looking out of her upstate NY hospital room window this week, she watched as the leaves began to change colors and float from the trees. She recalled a poem she adored from the 6th grade. She remembered just the first line, “There is something in the Autumn that is native to my blood.” I learned then that she and I both share a love of the fall. We googled it and the beautiful words below, from a 16th century poet, are what we found. My first real yoga “injury” happened earlier this year in a headstand (sirsasana I). One should remember to loosen the interlocked fingers, relax, go limp and flex the knees. Then one will just roll over and smile. But, I didn’t want to fall in a yoga class; my ego told me that I am a yoga teacher and, therefore, should not fall in front of others. I stayed up until we were cued to come down and take child’s pose. It hurt…a lot. Later in the class, we were cued into another headstand variation (sirsasana II), where we played with some fancy garudasana leg variations, and I did it. After class, I could not turn my head to the left or bring my ear to my shoulder. I applied heat for a few days, got a bunch of massages, and did all of the neck and shoulder stretches I knew, but I was still sneaking in a few painful headstands at home. (My ego didn’t want to “lose” its headstand practice!) It took a week or so and the stiffness lessened, but the pain and restricted range of motion did not. Literally 4 months later, with little improvement, I told a physical therapist yoga friend about it. That was my turning point. (Thank you Lindsay!!!) She identified the muscle- the levator scapulae. And showed me the stretch for it- tip head down and to the side, place opposite hand behind back, use hand of same side to give added stretch. She also suggested I continue applying heat- even this number of months later. And, no more sneaking in headstands. I took the advice and used the time off from headstand to work on pinca mayurasana (forearm stand) and actually study up on headstand. I found varied opinions on how much weight to actually bear on the head and where exactly to balance. So we will all have to form our own opinions about that. But, here is an explanation of how to find the crown of the head that made the most sense to me. The crown of the head can be found by placing the right palm of the hand on the forehead and allowing the fingers to spread over the crown of the head, where the tip of the middle finger lands is basically the crown of the head. This point should line up with the ears as well. Last week, I literally woke up one morning and the pain was gone. I had full range of motion. So, after over a month of dedicated time off from headstand, I decided to give it a try again- putting to use all of my new knowledge along with my new core and upper body strength from forearm stand. It felt better and more stable then any other headstand I had ever done before. 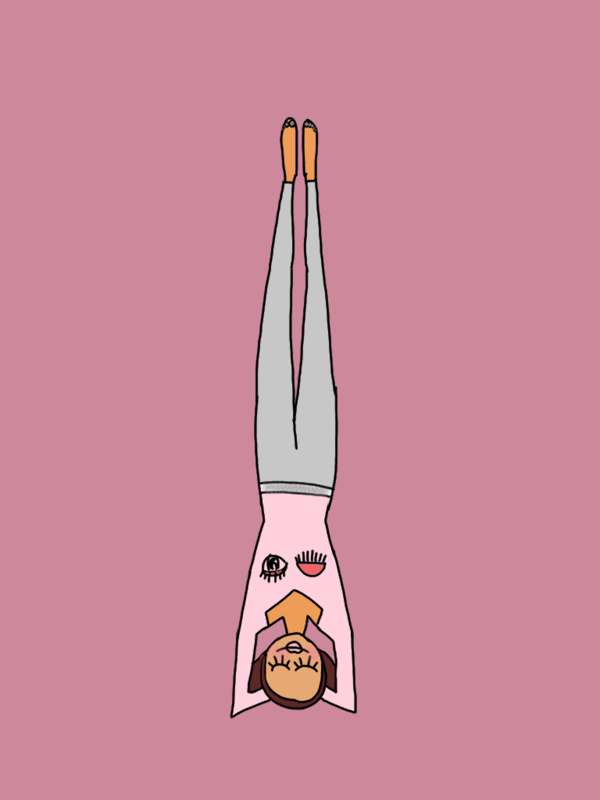 I may continue to experience occasional tension and tightness in my neck and will continue to stretch and heat when needed, but I will not approach headstand the same way ever again. Make sure your hair is not going to threaten your balance. Lower your ponytail and/or remove any hair accessories from the top of your head when preparing to take the posture. If you cannot hold dolphin pose comfortably for 5 breaths, while shortening the distance between feet and elbows, IN MY OPINION, you are probably not yet strong enough in the upper body for sirsasana I. I just feel that strength in the upper body must be developed to avoid excessive weight, stress and injury to the neck. I found that working with dolphin and forearm stand helped me find that strength. NO hopping, skipping, or jumping up into headstand! Learn to enter the posture by walking your feet close enough to your elbows that bringing one, then both, knees into the chest feels like floating. Hold- and then straighten the legs. I didn’t classify the way I was practicing (lifting 1 leg, making an “L” by raising the 2nd leg, and then joining the legs) as kicking up, but I realized that I was actually hopping into the “L”. That meant that I was using momentum, not core, to find the pose. I also did a lot of “teeter-tottering” in my headstand, constantly catching my balance by shifting weight between my wrists and elbows. Dolphin plank is great at firing up the core and building strength. Don’t rush. Pause and breath in each stage of the pose, use your breath to gauge your readiness to move further. There are no benefits to getting into headstand today vs. next week, month, or year. Build strength first and enjoy the pose safely. Know your practice. Know that you don’t have to do everything the teacher cues. Know that taking breaks or choosing not to practice a posture one day because your body is not feeling it is also yoga. Know that pain is different from sensation and is your body’s way of telling you to STOP. There has been a lot of controversy in the press about headstand. You have to make your own decision to practice it or not. But, if you choose to…please make sure you are ready. I realize today that I was not. But I am now.